This young patient presented with a discolored white filling done fairly recently. It was recommended that she complete a "cap" on this tooth. After a consult with this patient, we recommended a conservative white filling. Below is a patient that presented with multiple cavities beneath existing fillings. 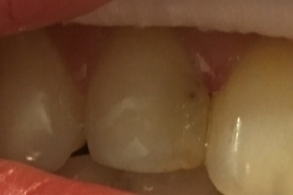 After discussing various treatment options, conservative white fillings were completed in one visit to restore her bite and remove her discomfort.